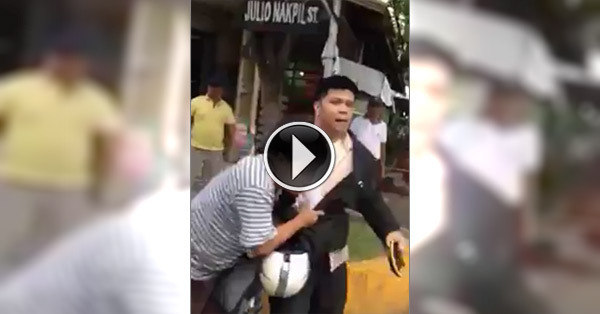 Video shows former Iglesia Ni Cristo minister Lowell Menorca being arrested by cops in plainclothes over a libel case filed by the INC. In an interview on dzMM, Menorca said he was about to go to the Court of Appeals (CA) to attend a hearing on his petition for writs of amparo and habeas corpus when motorcycle-riding men claiming to be police officers accosted him and his companions. The commotion along Roxas Boulevard was captured on video by Jinky Otsuka, twin sister of Seiko (Menorca's wife). The footage has gone viral on Facebook. One of the cops tried to present an arrest warrant, which he said was an alias warrant (issued by the court when no plea was entered), but refused to show it to him, according to the ex-INC minister. At least 20 police officers in uniform later arrived and arrested Menorca. Pandacan Police Station chief Supt. Ed Leonardo has confirmed to ABS-CBN News that the two men who served the arrest warrant from Marawi City were cops. Leonardo, said to be also a member of the INC, told the news team that he allowed policemen in plainclothes to accost Menorca so that he would not elude arrest. Menorca is one of those accused of running the controversial anti-Iglesia Ni Cristo blog created by a certain Antonio Ebangelista. The former INC minister earlier claimed that he was abducted by policemen on orders from the INC leadership.